Andrei Tarkovsky (1932-1986) was a gifted filmmaker noted for his uniquely expressive style. 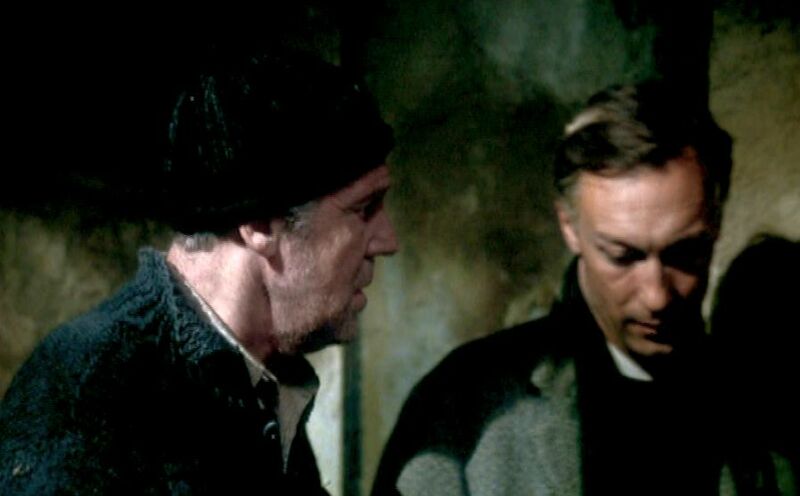 Working in Russia under restrictive conditions, he was only able to make seven feature films over his last twenty-four years, but each was a fascinating and challenging work of cinematic expression. In particular, Tarkovsky was progressively more sensitive to the possibilities of cinematic expression transcending the limits of textual expression and directly invoking the wider range and complexity of human consciousness. Increasingly, his films became more and more attempts to directly represent his own personal feelings, with minimal reference to schematic models or thoughts. 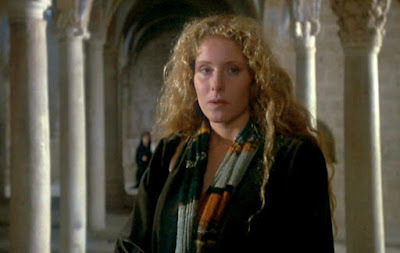 One of the most extreme examples of this tendency was his penultimate film, Nostalghia (1983). which, despite their often seemingly random appearance, must have required careful planning in order to execute effectively. The story of Nostalghia, such as it is, passes through four phases. As already mentioned, the Russian writer Andrei Gorchakov (played by Oleg Yankovsky – he played the father of the main character in Tarkovsky’s The Mirror) has come to Italy to write about an 18th century Russian composer, Pavel Sasnovsky, who lived in Italy for a few years before returning to Russia (where he committed suicide). Gorchakov is accompanied by his attractive translator, Eugenia (Domiziana Giordano), and we soon see that these two embody contrasting types. Eugenia embraces modernism; while Gorchakov is alienated from the world he sees around him. When she invites him to go look at Piero della Francesca’s famous painting “Madonna del Parto”, he glumly responds by saying, “I’m tired of these sickeningly beautiful sights.” Later when Eugenia is reading some poetry (written by Andrei Tarkovsky’s father, Arseny Tarkovsky) in translation, Gorchakov remarks that “poetry is untranslatable, like all art.” This suggests to us that Gorchakov perceives insurmountable cultural barriers as part of his nostalghia problem. 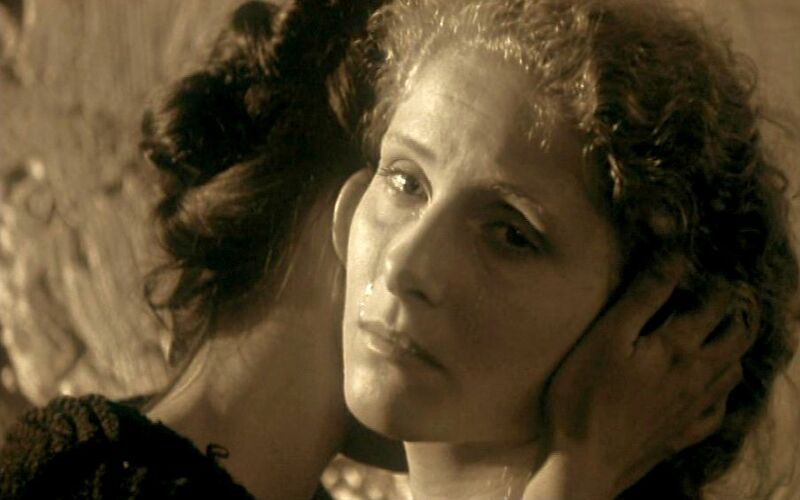 Later they check-in to a hotel, where in a long 4-minute shot Gorchakov is shown listlessly falling asleep in his bed and lapsing into dreams (shown in sepia-toned monochrome images). Domenico then tells Gorchakov that if he can walk the length of St. Catherine’s Pool holding a lighted candle, it will save the world. 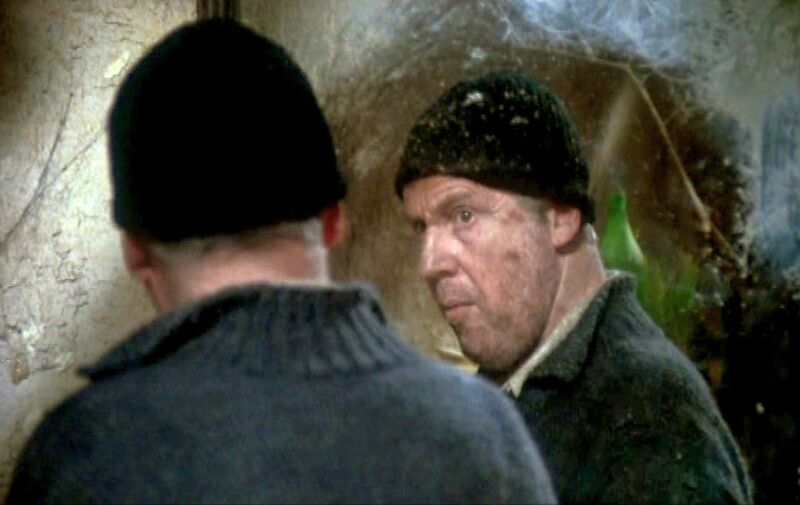 But the people there assume he is crazy and won’t let him enter the pool, so he begs Gorchakov to assume his world-saving task. Back with Eugenia at the hotel, Gorchakov tells her about Domenico’s lighted-candle task. But Eugenia, who has been hoping that Gorchakov would take a romantic interest in her, doesn’t want to hear about his odd obsessions. In a dramatic four-minute monologue, she complains that he is only interested in Madonnas and not interested in engaging with real life. Afterwards, they engage in a bitter quarrel. 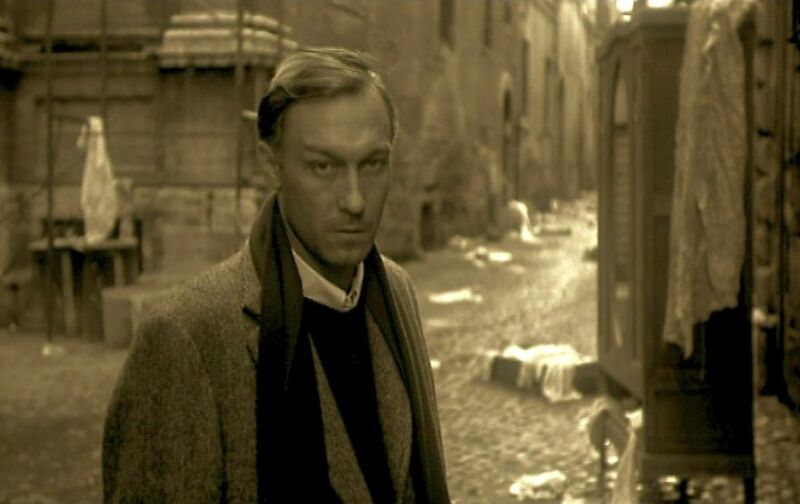 After Eugenia storms out, Gorchakov, who seems to be in declining health, lapses into further sepia-toned dreams, which indicate that Gorchakov identifies himself with Domenico. With Eugenia having left him, Gorchakov decides to return home. But just before he is to leave, he gets a phone call from Eugenia, who is now in Rome. She tells him that Domenico has come there and is making cryptic speeches at a city monument. She also says that Domenico wants to know if Gorchakov has carried out the lighted-candle ritual in the pool. 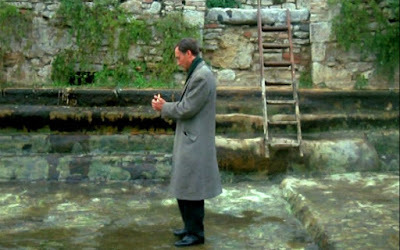 Finally, in the film's penultimate, nine-minute, shot, we see that Gorchakov has arrived at the pool when it has been drained for servicing. Nevertheless, he painstakingly and desperately carries out the ritual, anyway; and he finally manages to place the lighted candle he has been carrying at the far end of the pool just before collapsing. 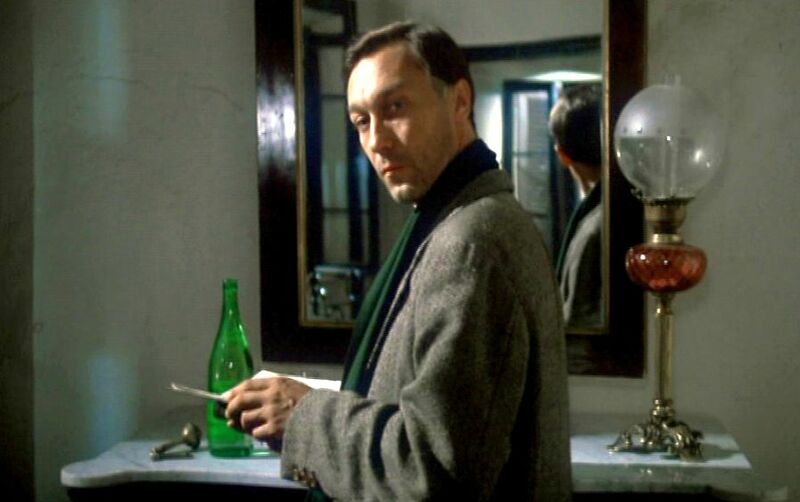 Patrick Bureau, “Andrei Tarkovsky: I Am for a Poetic Cinema” (1962), from Andrei Tarkovsky Interviews, (John Gianvito, ed. ), University of Mississippi, Jackson, (2006), quoted in Diane Christian and Bruce Jackson (eds. 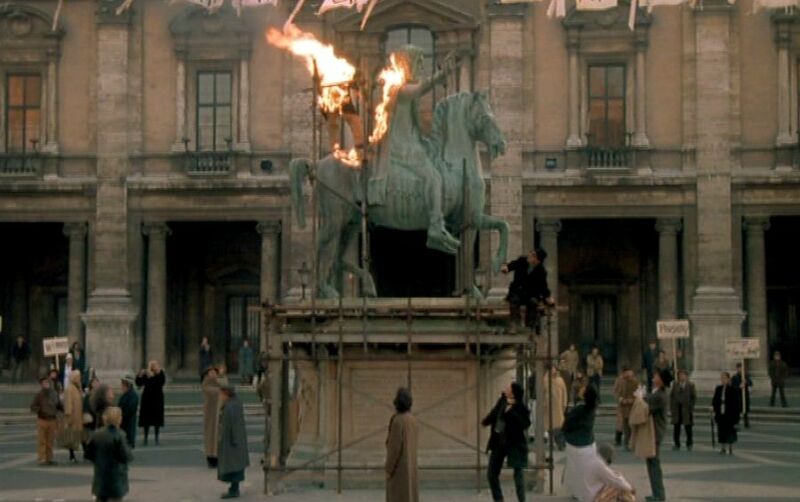 ), “Conversations About Great Films: Andrei Tarkovsky NOSTALGHIA (1983)”, Goldenrod Handouts, Buffalo Film Seminars, (XXXV:8), The Center for Studies in American Culture, State University of New York, Buffalo, NY, (17 October 2017). Andrey Tarkovsky, Sculpting in Time: Reflections on the Cinema, University of Texas Press Austin (1986, 2000), quoted in Diane Christian and Bruce Jackson (eds. ), “Conversations About Great Films: Andrei Tarkovsky NOSTALGHIA (1983)”, Goldenrod Handouts, Buffalo Film Seminars, (XXXV:8), The Center for Studies in American Culture, State University of New York, Buffalo, NY, (17 October 2017). Andrey Tarkovsky, Sculpting in Time: Reflections on the Cinema, University of Texas Press, Austin (1986, 2000), quoted in Diane Christian and Bruce Jackson (eds. ), “Conversations About Great Films: Andrei Tarkovsky The Mirror 1974”, Goldenrod Handouts, Buffalo Film Seminars, (IX:13), The Center for Studies in American Culture, State University of New York, Buffalo, NY (16 November 2004). Steven Crowell, “Existentialism”, Stanford Encyclopedia of Philosophy, (9 March 2015). David Leopold, “Alienation”, Stanford Encyclopedia of Philosophy, (30 August 2018). 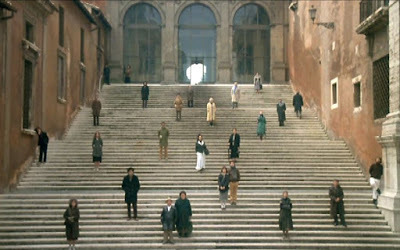 The Film Sufi, “Cinematic Expression in ‘L’Avventura’”, The Film Sufi, (27 August 2010). The Film Sufi, “‘Taxi Driver’ - Martin Scorsese (1976)”, The Film Sufi, (30 November 2012). The Film Sufi, “‘In the Mood for Love’ - Wong Kar Wai (2000)”, The Film Sufi, (10 May 2016). The Film Sufi, "’L’Eclisse’ - Michelangelo Antonioni (1962)”, The Film Sufi, (14 August 2010). The Film Sufi, “‘Badlands’ - Terrence Malick (1973)”, The Film Sufi, (12 June 2012). 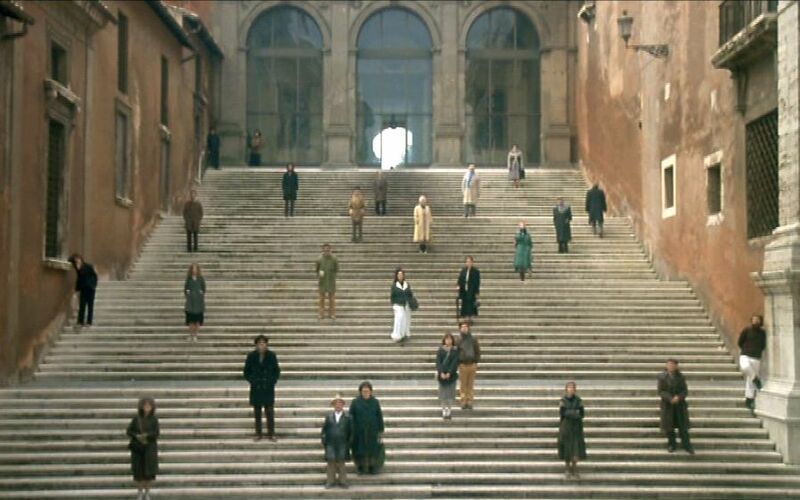 J. Hoberman, “A Man Without a Nation, in Italy”, The New York Times, (24 Jan 2014). 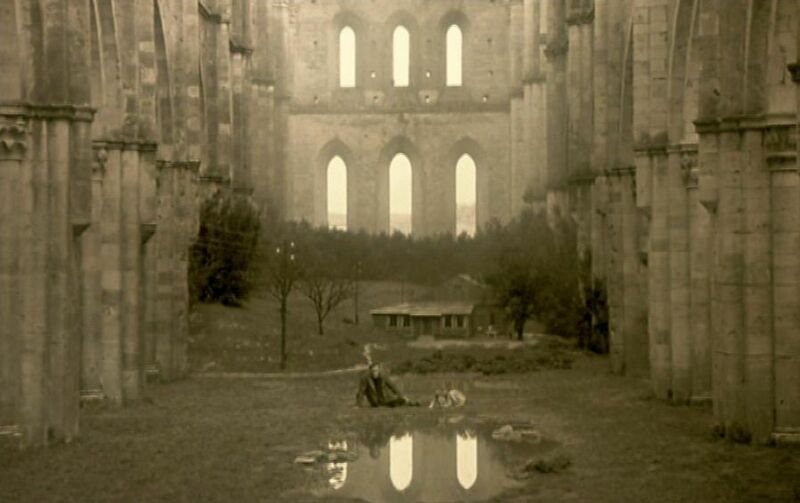 Kalvin Henely, “Nostalghia”, Slant, (30 May 2013).